As soon you enter Katendrecht, crossing the Rijnhaven bridge, in Rotterdam also known as the ‘Hoerenloper’, the smell of barbecue, coffee and other goodness will hit you. Of course you should grab some coffee at Posse and some food at the Fenix Food Factory and top it all off with a good cup of Kopi Soesoe (check the Kopi Soesoe article). Somewhat hidden in a corner you can find The Dutch Pinball Museum. 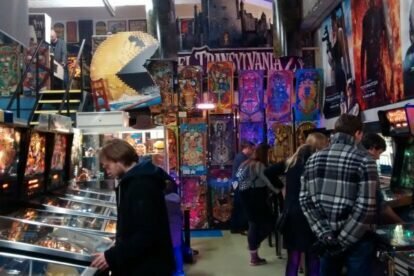 An old storage house loaded with around 70 pinball machines originating from the 1900s till today. A place where the young create new experiences and the old relive them. After paying a small entrance fee you can go all the way on all the different machines. My friends and I have already spent quite some hours on the ‘Lord of the Rings’ machine, though the ‘Medieval Castle’ is also a nice one. Try to find out the story of the game and what to hit to get the ‘multi ball’, the best way to get a high score. You can also play multi-player games if you want to beat your friends. The loser pays the first round of beer at ‘De Kaapse Brouwers’ just around the corner. Have fun and don’t forget to treat the machines just the way you would treat your partner. Tip: Also cool to go to Katendrecht by Watertaxi (check article: Watertaxi).